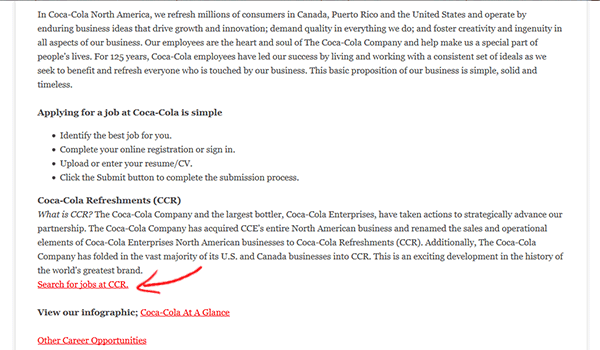 Use the instructions posted below to learn how to search for current openings and apply for them using the online Coca-Cola job application. It should be noted that at this time there is currently no official printable application available. The online hiring process is relatively streamlined, however if you need any assistance during it refer to the reference guide posted below. About the Company: The Coca-Cola Company is an American beverage corporation headquartered out of Atlanta, Georgia. It is one of the largest beverage companies in the world, and has numerous multinational offices. The Coca-Cola brand is one of the most recognizable in the world. Step 1 – Go to the main job search page by pressing on this link. Step 2 – Scroll down the page and then click on the region that you live in (e.g. Europe, North America, etc.). 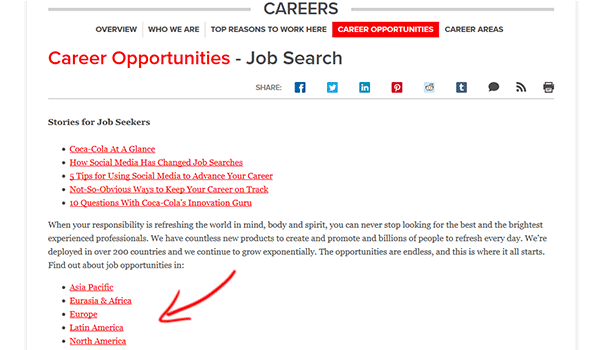 Step 3 – Scroll down the page and then hit the “Search Jobs” link. Step 4 – Once on the main careers page click the “Search Careers” button. Step 5 – Search by keyword, category, country, distance, or employment type. Step 6 – Press the “Search” button to load the results. Step 7 – Click the link of the job that you want to submit an application for. Step 8 – Read the description of the job and then press the “Apply” button. Step 9 – Sign in to your account, or click the “Create a new account” button to load the registration form. Step 11 – Click the “Sign Up” button to create your profile. Step 12 – Agree to the privacy agreement. Step 13 – Submit your cover letter/resume. Step 15 – Click the “Next” button to load the next section. Submit the required information for all of the remaining subsections of the form to finish the online application process.